This rustic Roasted Peach Skillet Cobbler is easy enough for a weeknight dessert or fancy enough for guests. 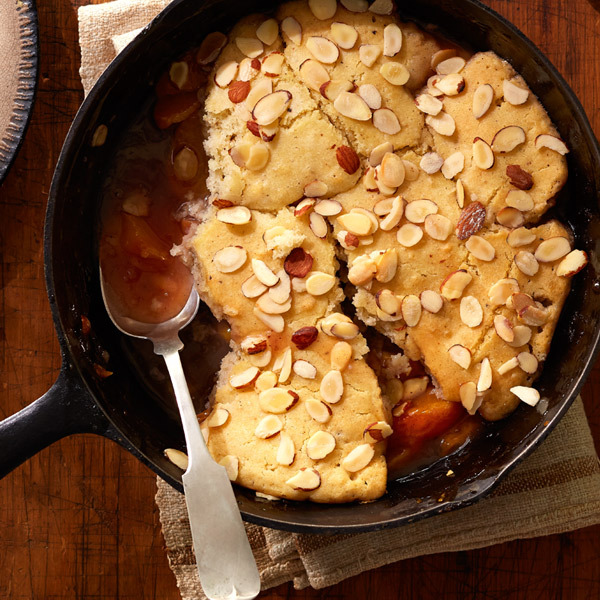 A fresh-picked peach fruit filling is topped with a flaky, almond-buttermilk biscuit topping and baked in a cast-iron skillet. Serve this delicious peach cobbler recipe warm with our Honey-Lavender Ice Cream for an extra-special treat. In a small bowl, combine sugar, tapioca flour, cinnamon and nutmeg; mix thoroughly. Slice the peaches into ½-inch wedges, removing pit. Gently toss peach slices into sugar mixture. Transfer the fruit mixture into a buttered 12-inch, cast-iron skillet. Place skillet in hot oven and roast the peaches for 20 minutes. You can place a tray lined with foil under the skillet to avoid fruit spills. Meanwhile, combine the first 6 dry ingredients in a medium mixing bowl. Cut in the butter pats with your fingers or fork. Mix in the buttermilk until barely combined; do not over mix. Remove the roasted peaches from the oven. Carefully drop large spoonfuls of the biscuit topping over the top of peaches, covering the entire surface. Sprinkle sliced almonds on the top and return to the oven. Bake an additional 25 minutes or until knife comes out clean and top has a golden crust. Let cool for at least 30 minutes; this treat is best served warm.